Normally on-court rivals in the GCHSAA varsity ‘A’ hoops division, Fontbonne Hall, Bay Ridge, and Msgr. 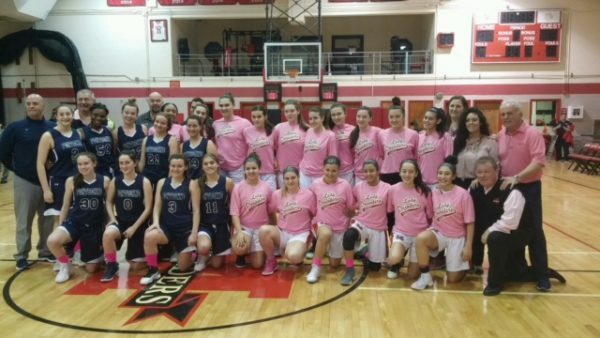 McClancy M.H.S., East Elmhurst, combined forces to contribute to breast cancer research. On “Pink Night” Feb. 12, the teams raised over $1,000 for Hands of Hope. The Bonnies edged the Lady Crusaders, 58-56. 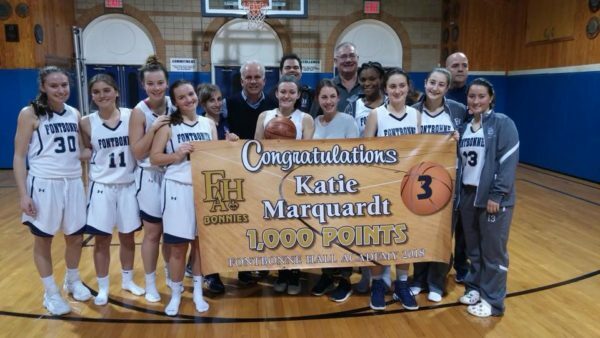 In her last home game as a member of the Fontbonne Hall Academy varsity basketball team, senior guard Katie Marquardt scored her 1,000th career point on Feb. 7 – a Senior Night victory over division rival Msgr. McClancy H.S., East Elmhurst. The team captain and three-time Tablet All-Star, who played Catholic Youth Organization hoops for St. Francis de Sales, Belle Harbor, is set to continue her career at Molloy College, Rockville Centre, L.I. The St. Kevin’s Youth Guild will host a football clinic with the pros Saturday, March 17 at 10 a.m. at St. Kevin’s Catholic Academy, Flushing. Normally a baseball clinic, this year the focus shifts to football, given the parish’s interest in Catholic Youth Organization flag football. Two former NFL players – two-time Pro Bowl wide receiver Wesley Walker of the New York Jets and two-time Super Bowl champion punter Sean Landeta of the New York Giants – will be on hand to teach participants the skills to lead to gridiron greatness, as well as sign autographs. For more information and to register, contact John Bonanno at 718-640-7645. 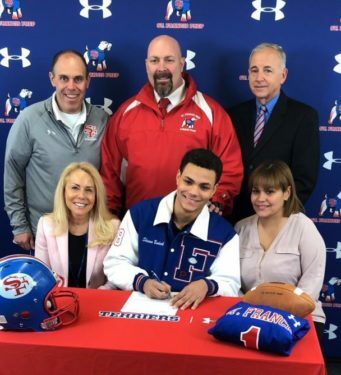 Shawn Bendeck, a senior varsity football player at St. Francis Prep, Fresh Meadows, signed a National Letter of Intent to play at L.I.U. Post, Brookville, L.I. As a linebacker in 2017, the Glendale native and team captain led the CHSFL with 121 total tackles. He added 14 tackles for a loss, one interception and five forced fumbles. For his efforts, he was named to the CHSFL All-League team and the Class ‘A’ All-State team. The two-time Tablet All-Star will shift to defensive back for the Pioneers this fall.